“Chromecast is a thumb-sized media streaming device that plugs into the HDMI port on your TV. Simply use an Android phone, tablet, iPhone, iPad” – Said on its office site. If you try to stream all your movies to your Chromecast equipped TV using your PC or Allcast, you may find some of the media files only have video but no audio played. However all these videos are MKV or MP4 which should be supported and can be played with both picture and audio on smart phone and PC. How to solve no audio on Chromecast with Allcast issue? Why the audio part can’t be streamed well? What do you need to do when you discover that while the video was fine you have no audio? If you have any of the above issues, you come to the right place. In the following article, we will show you step-by-step guide to stream any media properly. Chromecast has limitation in the input formats. Only video containers MP4 and WebM encoded with Video codecs H.264 High Profile Level 4.1, 4.2 and 5, VP8 and audio codecs HE-AAC, LC-AAC, CELT/Opus, MP3, Vorbis are compatible with Chromecast. MP4 and MKV are media containers which support multiple video/audio codec. If you would like to streaming video to Chromecast equipped TV with PC or Allcast, first you need to make sure both the audio and video codecs are supported by Chromecast. According to official website, video should be encoded in H.264 or VP8 and audio part need to be saved in AAC, MP3, Vorbis, WAV or FLAC. The MKV video which can’t be played with audio through Chromecast may contain DTS or AC3 audio codec which is unsupported by Chromecast. 2.In each of those apps, you simply press the “Cast” icon and select your Chromecast, and the video gets sent to your TV. 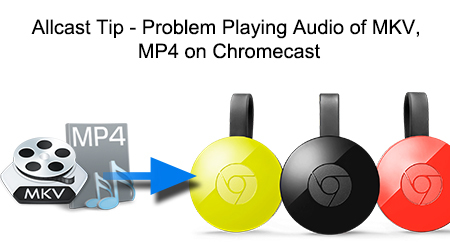 Part 3: How to Chromecast MKV, AVI, MP4, FLV, WMV, MPG, MOV to Which can’t be streamed well? There are lots of media converter tools, however few converters help to fast re-encode audio track without converting video stream. In order to solve the problem playing audio of MKV, MP4 on Chromecast supported format efficiently, we recommend you to try Pavtube Video Converter Ultimate. It will only take a few seconds to convert the audio part to AAC for Chromecast equipped TV and keep the original high quality picture. Here is review. Besides, It can convert almost all kinds of video files like MP4, WebM, MKV, AVI, FLV, WMV, MPG, MOV, OGV, WTV, 3GP, 3G2, 3GPP, 3GPP2, MPEG-4, MJPEG, MJPG, H.263, H.264, RM, M4V, QT, DAT, 720p/1080p AVCHD, MTS, M2TS, M2T, TS, TOD, MOD, etc to Chromecast fomats. Acting as the Chromecast Audio Converter, Pavtube Chromecast Video Converter can convert various audio file like DTS, AIFF, Apple Lossless, AMR, AC3, AAC, APE, WMA, WAV, M4A, M4R, CAF, VOC, QCP, MP2, 3GA, and etc to Chromecast compatible audio format. Simply drag and drop local media you want to send to Chromecast to the software (Mac version). Or click “File” button of the program to open files soon. It supports batch conversion so I add 4 movies at a time to convert. Click on the drop down menu of the Format, select “HD Video > H.264 HD Video(*.mp4)” or “Common Video” > “H.264 High Profile Video(*.mp4)” as the target format. It fits on Chromecast for playback. Tips: Then click “Settings” button next to Profile to expand “Advanced Settings” panel. There select “Copy” for Video Codec, so the software will not re-encode video part to save time. What’s more, without conversion, we will not loss any video quality. Below the video codec option, you will find Audio Codec option. Please choose AAC. If you add several videos, just click Apply to ALL to keep the settings for all videos. At the end, go back to the main interface to click the ‘Convert’ button, without waiting for a long time, you can get the output result. AllCast is an app that lets you stream videos, music, photos, or other content from an Android phone to a TV. You can use it with just about any TV connected to a Chromecast, Roku, Apple TV, WDTV, Xbox, or some other Samsung or Panasonic Smart TVs or devices with DLNA renderers. Stream supported and unsupported video through Chromecast?